Last year I had a post with similar pictures. 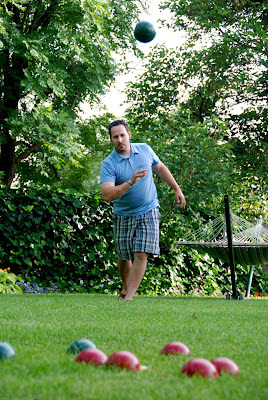 But, bocce is a game that is played so often during the summer, that I decided it was worthy of another post. In fact, it will probably get a number of posts. On Father's Day, we went down to my parents and my aunt and uncle's. (Their backyards are connected by a gate, so we often have festivities in both yards). We had my uncle's wonderful South American BBQ. It's a Mother's Day favorite, but we didn't get together this Mother's Day, so we had it for Father's Day. 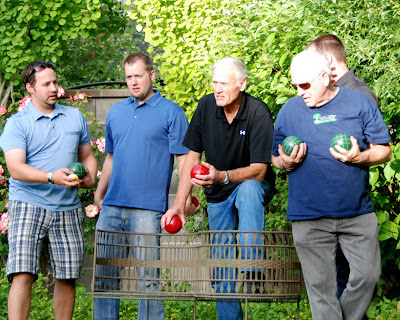 After the meal was over, the men found their way out to the backyard for a competitive game of bocce. I don't ever ask who won, because it just doesn't matter. Okay, that's a lie, we all know winning matters, but if your husband just might have been on the losing team, it's better not to ask. I had fun taking some pictures of these avid players. 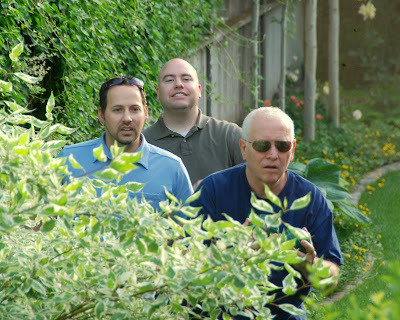 and amongst the pictures, I captured these three men of mystery. 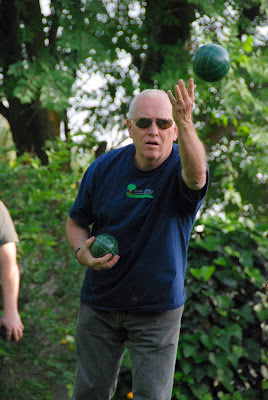 If you look closely, you can see a green ball in Uncle's hand- and then the mystery is ruined. The yard looks soooo beautiful! I'm so sad I'm going to miss it this year. Think about me every second, will ya? I wish I could be there!!!! I have to admit, I saw the bocce ball in your original post of Men of Mystery. It didn't detract from the effect at all. Great shot!